A black thermoplastic molding composition which containing a dye combination made from nonabsorbing, non-black polymer-soluble dyes which produce a black thermoplastic molding composition which is translucent or transparent to laser light. This application is a continuation in part of German Application Number 199 06 828.3 filed Feb. 18, 1999 and a continuation in part of U.S. application Ser. No. 09/505,790 filed Feb. 17, 2000. Both of these applications are incorporated by reference in their entireties for all useful purposes. Polycarbonates are known materials and are described, for example, in Saechtling, Kunststoff-Taschenbuch, 27 th edition 1998, Hanser Verlag, on pages 479 to 485. Polycarbonates can for example be prepared by reaction of bisphenol A with phosgene, or melt condensation of diphenyl carbonate with bisphenol A. Possible comonomers used are also bisphenol TMC and bisphenol S (Dihydroxydiphenylsulfide). The flame retardance of these materials may be improved by using a halogenated bisphenol derivative, in particular a brominated bisphenol derivative. The polyamides which are suitable according to the invention are described for example, in Saechtling, Kunststoff-Taschenbuch, 27 th edition 1998, Hanser Verlag, on pages 465 to 478.
wherein R 9, R10, R11 and R12 are identical or different and are a hydrogen atom, a linear or branched, saturated or unsaturated C1-C20-hydrocarbon radical, such as a C1-C8-alkyl radical, or a C6-C18-aryl radical. The working example below is intended to give the skilled worker a more detailed description of the invention and the advantages achievable therewith. 1. A black thermoplastic molding composition which comprises a dye combination made from nonabsorbing, non-black polymer-soluble dyes which produce a black thermoplastic molding composition which is translucent or transparent to laser light. 2. 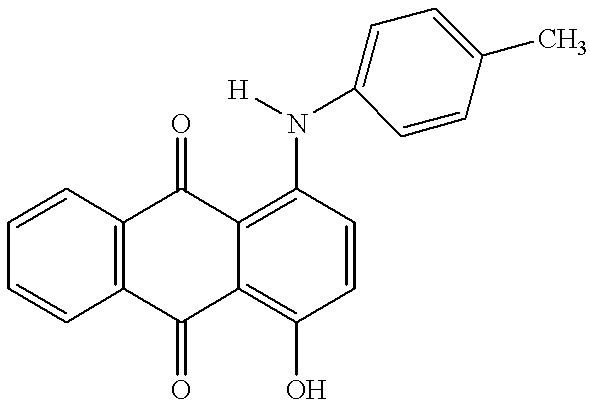 The composition as claimed in claim 1, wherein said dyes are chinophthalone or anthrachinone group of dyes. 3. The composition as claimed in claim 1, the combination of dyes comprises a yellow dye and a violet dye. 4. The composition as claimed in claim 1, the combination of dyes comprises a combination of at least one red dye and at least one cyan dye. 5. The composition as claimed in claim 1, the combination of dyes comprises a combination of at least one red dye, at least one blue dye and at least one yellow dye. 6. The composition as claimed in claim 1, the combination of dyes comprises a combination of at least one red dye, at least one yellow dye and at least one green dye. 7. The composition as claimed in claim 3, wherein the yellow dye is Solvent Yellow 93 (Sandoplast Yellow 3G), Solvent Yellow 114 (Sandoplast Yellow 2G), Solvent Yellow 98 or Solvent Yellow 133 (Polysynthren Yellow GG) or a mixture thereof. 8. The composition as claimed in claim 3, wherein the violet dye is Solvent Violet 13 (Sandoplast Violet RSB), Solvent Violet 37 (Sandoplast Violet FBL) or Solvent Violet 49 (Polysynthren Violet G) or a mixture thereof. 9. The composition as claimed in claim 7, wherein the violet dye is Solvent Violet 13 (Sandoplast Violet RSB), Solvent Violet 37 (Sandoplast Violet FBL) or Solvent Violet 49 (Polysynthren Violet G) or mixtures thereof. 10. The composition as claimed in claim 4, wherein the red dye is Solvent Red 179 (Sandoplast Red 2G), Solvent Red 135 (Sandoplast Red G), Solvent Red 111 (Sandoplast Red PFS) or Solvent Red 195 (Sandoplast Red BB) or mixtures thereof. 11. The composition as claimed in claim 5, wherein the red dye is Solvent Red 179 (Sandoplast Red 2G), Solvent Red 135 (Sandoplast Red G), Solvent Red 111 (Sandoplast Red PFS) or Solvent Red 195 (Sandoplast Red BB) or mixtures thereof. 12. The composition as claimed in claim 6, wherein the red dye is Solvent Red 179 (Sandoplast Red 2G), Solvent Red 135 (Sandoplast Red G), Solvent Red 111 (Sandoplast Red PFS) or Solvent Red 195 (Sandoplast Red BB) or mixtures thereof. 13. The composition as claimed in claim 5, wherein the blue dye is Solvent Blue 104 (Sandoplast Blue 2B), Solvent Blue 122 (Polysynthren Blue R), Solvent Blue 45 (Polysynthren Blue RLS) and Solvent Blue 104 (Polysynthren Blue RBL) or mixtures thereof. 14. The composition as claimed in claim 5, wherein the yellow dye is Solvent Yellow 93 (Sandoplast Yellow 3G), Solvent Yellow 114 (Sandoplast Yellow 2G), Solvent Yellow 98 or Solvent Yellow 133 (Polysynthren Yellow GG) or a mixture thereof. 15. The composition as claimed in claim 11, wherein the blue dye is Solvent Blue 104 (Sandoplast Blue 2B), Solvent Blue 122 (Polysynthren Blue R), Solvent Blue 45 (Polysynthren Blue RLS) and Solvent Blue 104 (Polysynthren Blue RBL) or mixtures thereof, and said yellow dye is Solvent Yellow 93 (Sandoplast Yellow 3G), Solvent Yellow 114 (Sandoplast Yellow 2G), Solvent Yellow 98 or Solvent Yellow 133 (Polysynthren Yellow GG) or a mixture thereof. 16. The composition as claimed in claim 6, wherein the yellow dye is Solvent Yellow 93 (Sandoplast Yellow 3G), Solvent Yellow 114 (Sandoplast Yellow 2G), Solvent Yellow 98 or Solvent Yellow 133 (Polysynthren Yellow GG) or a mixture thereof. 17. The composition as claimed in claim 6, wherein said green dye is Solvent Green 3 (Sandoplast Green GSB) or Solvent Green 28 (Sandoplast Green G) or mixtures thereof. 18. The composition as claimed in claim 12, wherein the yellow dye is Solvent Yellow 93 (Sandoplast Yellow 3G), Solvent Yellow 114 (Sandoplast Yellow 2G), Solvent Yellow 98 or Solvent Yellow 133 (Polysynthren Yellow GG) or a mixture thereof and said green dye is Solvent Green 3 (Sandoplast Green GSB) or Solvent Green 28 (Sandoplast Green G) or mixtures thereof. 19. The composition as claimed in claim 1, wherein said thermoplastics is based on one or more of the following polymers: cycloolefin copolymers (COC), polystyrene, styrene-acrylonitrile-Copolymer, polycarbonate, polyacrylate, polyester, polyamide or a blend thereof. 20. The composition as claimed in claim 2, wherein the thermoplastic is a polyester, polycarbonate or a polyamide. 21. The composition as claimed in claim 3, wherein the thermoplastic is a polyester, polycarbonate or a polyamide. 22. The composition as claimed in claim 3, wherein the yellow dye is used in an amount from about 0.1 to about 2 g, per kg of thermoplastic. 23. The composition as claimed in claim 3, wherein the yellow dye is used in an amount from about 0.5 to about 1.5 g, per kg of thermoplastic. 24. The composition as claimed in claim 3, wherein the violet dye is used in an amount from about 2 to about 10 g, per kg of thermoplastic. 25. The composition as claimed in claim 23, wherein the violet dye is used in an amount from about 3 to about 8 g, per kg of thermoplastic. 26. The composition as claimed in claim 25, wherein the thermoplastic is a polyester, polycarbonate or a polyamide. 27. The composition as claimed in claim 3, wherein said violet dye is Solvent Violet 13 and said yellow dye is Solvent Yellow 114. 28. The composition as claimed in claim 26, wherein said violet dye is Solvent Violet 13 and said yellow dye is Solvent Yellow 114. 29. The composition as claimed in claim 1, which further comprise at least one of the following additional materials selected from the group consisting of additives, fillers and processing aids. 30. A method of bonding two thermoplastic materials together which comprises laser welding the thermoplastic molding composition as claimed in claim 1 to a different thermoplastic material. 31. The method as claimed in claim 30, wherein said different thermoplastic material is a material colored with absorbing dyes, pigments or absorbing fillers.